eD@HoMe: A lovely cover from France! Many thanks to Jérôme for sending this amazing cover from France. The 5 stamps on the right of the cover belong to the "Regional Portraits" series, issued on 26 Feb 2007. It is one of many series on this theme that La Poste has issued since 2002. 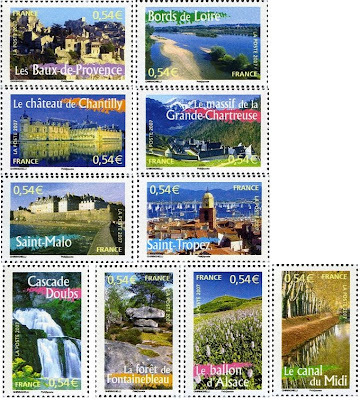 The year 2007 stamps depict Les Baux-de-Provence , Bords de Loire, Chantilly Chateau, Mountains of Grande Chartreuse, Saint-Malo, Saint -Tropez, Cascade Doubs, Fontainebleau Forest, Le ballon d'Alsace and Le Canal du Midi respectively. 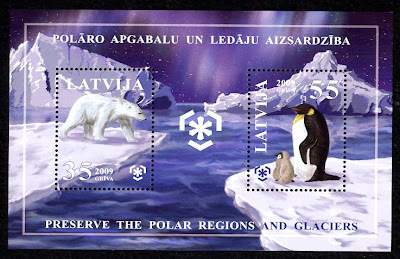 The souvenir sheet on the cover is from the "Preserve the Polar Regions and Glaciers" series, released by the Postal service of France on 28 Mar 2009. It is part of about 40 countries to issue stamps on this common theme. 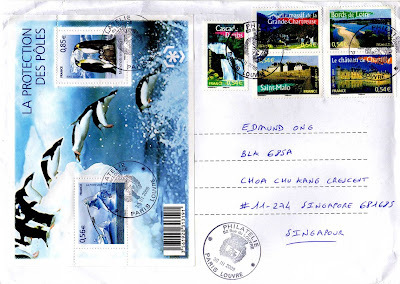 Below you will find pictures of twenty-eight countries' stamp issues. Stop Global Warming And Save Planet Earth! Amazing ! I love to see these issues again and again ! Just magnificent ! Amazing ! I love to see these nice stamps again and again ! Magnificent !